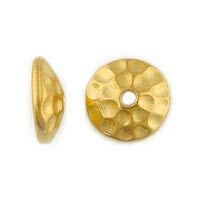 22 karat gold plated hammertone beadcap, 8mm. The 8mm size works great with our Venetian beads, especially the rounds 12mm and above. Try using these with some hammertone links for a really great look.